Having no outlet for your creativity is like sprinting in a marathon but never, ever moving from the starting line. Being a black Muslim female, afro-futuristic/Sci-Fi writer living in Detroit with no creative platform or community was hell. Sometimes, I think back to that time, just a few years ago, when I was that tormented artist. A confused artist who had nowhere to turn with three unsuccessful full-length novels under her belt that had been rejected over a hundred times each. Although I’m still not a published novelist, I’m not so much haunted by that fact as I was prior to Wilkes University. This change of heart may seem like a small feat to some, but it’s the largest accomplishment that I’ve come by in a long while. Detroit is a working and industrious city. I mean, our nickname is the Motor City, home of Ford! A decade ago, we weren’t known for best-selling novelists or creative writers like those successful individuals in New York or LA. We made cars and had a booming medical industry. In my family, those were the two fields that everyone entered: cars or sick people. You followed the trend. You followed the money. You didn’t follow instinct or your artistic gut. You stifled those feelings and didn’t look back. I found out that this was the biggest mistake of my life: listening to people who clearly had no clue who I was or who I could become. I began writing at the age of seven. My first story was entitled “King and Queen.” Mom helped me print it out, fold the dollar store paper into pamphlet form and send it off to the first contest I ever entered: The Reading Rainbow contest with my idol, Levar Burton. I didn’t win, but (in my seven-year-old mind) Levar sent me a heartfelt (OK, generic) letter letting me know that I didn’t make the cut. Nevertheless, that was the beginning of my love for reading and writing. But the agents, they stopped me right at the door. Rejection letter. Rejection email. Oh, and another rejection with a slice of rejection on the side. I cried and asked myself what I was doing wrong. Was my story not white enough for them? I mean, yeah, the main character was black but she was so cool. Why didn’t they just see that and give me the damn contract already? I couldn’t come to a legit conclusion, so I did what I have regretted ever since: I belittled myself. I remember walking down the campus sidewalk, moping from reading more rejection letters. I asked myself, who looked like me on the best-seller’s list? Had you ever seen someone so fat, and black, and Muslim on the list before? In YA? I answered my own questions, each with a ‘no.’ That day, I stopped writing completely and did not look back for six years. Six miserable years. I graduated with a funky degree in business that I had no interest in. I worked menial jobs in the medical field that I had no emotion for. I got married very early and dealt with family issues. I was angry, ready to fight anyone who wanted to get some. Something inside of me wanted out, but I kept beating it back. One day, I completely failed at life. Every aspect was shot to hell. I wasn’t dirt; I was beneath dirt. I was an empty carcass shrouded with depression and guilt. I was educated and unemployed. I was married, but then I wasn’t. I once had friends, but they were now ghosts. The only thing left were my tears, an empty stomach, and the clothes on my back. After considering an admittance to the county psych ward, I got myself some mental. I went to a therapist twice a week. She told me look at pretty things, eat fruit, and drink water. We started with small steps. Slowly, I began to see that sliver of light in a room seeping with blackness. I started applying for jobs in order to get myself together. I felt a little normal again. I managed to land an interview. On the way there, I got to thinking. I asked myself: what makes you happy? What would you do for free for the rest of your life? My response was swift: writing. Stories made me happy. At that moment, a light flipped on in my head. Why had I stopped writing? Why would I ever do such a thing? Abandon a piece of myself? I promised myself then that I’d never, ever stop writing again. And I never have. It’s been over six years now, and I am still on the couch writing, everyday. I was hungry for knowledge after that. I paid for creative writing classes and ordered all the books on editing. I even joined a few online communities for writers. I wrote two more novels and tried to get them published separately, but nothing stuck. The agents weren’t listening. Something was wrong with me, I thought. I was doing all the right things and still, nothing happened. One of my eccentric writing professors told me about an MFA program he graduated from in Vermont. I didn’t have the money to go back to school, and I had a full-time job so I thought it’d never happen. Two more years passed and I couldn’t find any quality writing groups in Detroit so I began to look into MFA programs. I had no idea how I’d pay for it or how I’d go out of town every six months, but it was worth a try. Eastern Michigan was the first school I applied to, and I was rejected from their creative writing program. It crushed me. But if there was a will, then there was a way. I researched some low-residency programs out of state. It was my last chance. I chose three colleges; Wilkes was one of them. I called all three. Left messages for two of them, but Wilkes was the only one to respond. I spoke to the Wilkes representative for almost an hour. She was gracious, truthful, and patiently answered my questions about campus diversity and anything else I wanted to know. I felt scared but good. I applied to Wilkes. Expecting a rejection letter, I was excited and surprised to learn I had been accepted. There was no turning back. I knew Wilkes University had a high rate of Caucasian students and staff, which concerned me. I was from Detroit and when a large group of white people congregated, I raised an eyebrow. To my surprise, I clicked with my cohort and staff immediately. I’d never felt so connected to complete strangers before. My work didn’t offend them, they gave constructive feedback, and above all they motivated me to do better, to keep writing and never stop. Why? Because they wouldn’t allow it, even if I tried. I returned home from my first residency at Wilkes, ready to be first on the best-seller’s list. I’d finally found a home, a community, and that encouraged me to reopen my creative outlets. Just a few months into the first semester, I was injured badly at work. Nearly incapacitated and going through extensive physical therapy, I still had work that needed to be done. I sat in bed, miserable, angry at my job for allowing me to be hurt and pushing off the blame. One morning, the sun shone into my bedroom. My body hurt, but the sun was glimmering and bright. I pondered my writing and how it could get me through this tough time. I connected two interests: my creative writing program and my fashion sense. Why not combine the two and start a fashion blog! It was totally spur of the moment and not well thought out. All I knew was that I’d be able to flex my writing muscle while off work. So that’s what I did. I started a plus-size style blog called Beauty and the Muse, and I’ve been blogging for about three years now. Before I applied to Wilkes, I researched numerous M.A./M.F.A. programs. Many of the articles were quite negative. They said that all you could do with a graduate creative writing degree was be a soul-sucking teacher, although a few said to go for it. I usually rely on reviews, but somehow I took that leap of faith and felt that if it works, it works, and if it doesn’t then I’m out around thirty grand and a few years of my life. I always tell people that the experiences I had, and still have, at Wilkes surpass all the money that I paid to go there. There is no monetary value on experiences, quality education, and the bonds developed between cohort members. I would never have had the courage to continue developing my craft if it weren’t for my cohort checking up on me or my mentor reminding me that, “it’s a process.” I would never have had the courage to open myself up to different people, toss away the shield I’d built, and cultivate meaningful relationships with other creative individuals. I can’t count how many doors have opened up for me since attending Wilkes. When I first started this essay, I talked about being a creative loner and how I thought that was the way to go in order to be successful. I couldn’t have been more wrong. In this writer’s life, there are many times when I just want to quit, stop the pain of editing and gruesome plot issues and critiques. But when there is a full and live community holding me up, pulling me along by my collar, or just holding my hand while inspiring me daily, I can’t see myself ever not strive for greatness. I can now say that I have found my community. At Wilkes, I found the creative community that I searched for all those years. This community will never know in what ways they changed me, all for the better. I’ve read literature that I never would have read. I wrote creative non-fiction and delved into the great works of the past. I’ve acted out scenes in class and done yoga. I’ve pitched to agents from New York and danced the night away on campus. 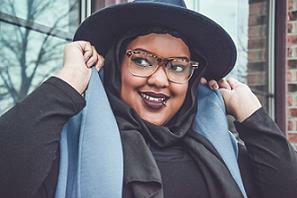 They will never know in what ways they have molded me into a fierce style blogger, a creative businesswoman, and a black Muslim writer who doesn’t hold back in her stories. I’ve made lasting connections and experienced things that I could never have dreamed. Leah Vernon received her M.A./M.F.A. from Wilkes University. She is a fashion blogger, writer, and wardrobe stylist. Visit her blog at beauty and the muse and on Instagram at Lvernon2000. This entry was posted on March 29, 2016 at 7:55 pm and is filed under Uncategorized. You can follow any responses to this entry through the RSS 2.0 feed. You can leave a response, or trackback from your own site.